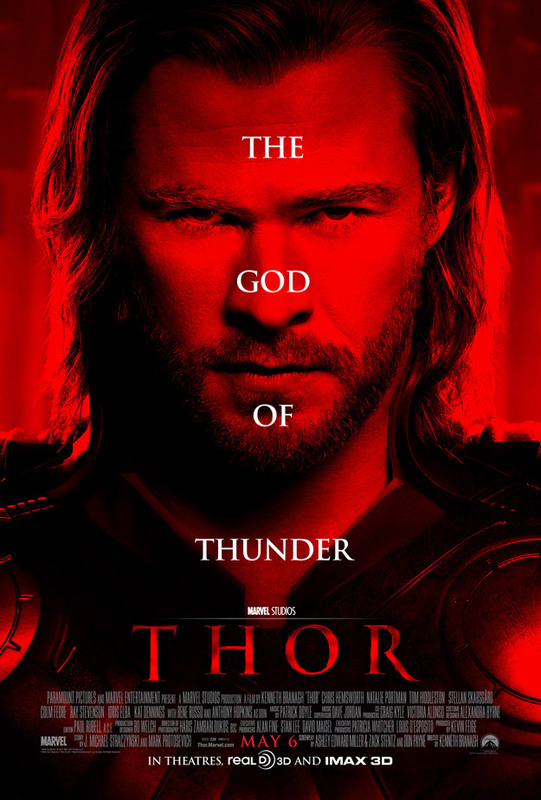 Film Review: ‘Thor’ is the best movie out this weekend! I didn’t know much about Thor. Only things I knew are from what the trailers showed. To be honest, what the trailers showed didn’t seem all that appealing to me. It looked like a different kind of superhero film than from what I’m used to. But after hearing many positive early reviews, I decided to keep an open mind for Thor. Yet, keeping an open mind wasn’t even necessary; because whatever frame of mind I could have had before seeing the movie wouldn’t deter how amazingly awesome I found Thor to be. Thor (Chris Hemsworth) is a warrior from a different realm called Asgard. His father (Anthony Hopkins) is the king of Asgard, and Thor will soon take his father’s place on the throne. However, his father is hesitant to let Thor be king. Thor is a great warrior, but he’s arrogant and headstrong. When he defies his father’s command, he is punished and sent to Earth. I was very impressed by Thor, especially Chris Hemsworth. He’s a relatively unknown actor, and I didn’t really hold much hope for his acting abilities. But I’m happy I was wrong. Hemsworth is full of ferocity, sincerity and charm. He makes a great superhero, especially for one like Thor. One of the first things you note about him is his bravado, but he still remains likeable, and continues to do so throughout the rest of the film. His best scenes were when he was on Earth and unaware of human customs; they were rightfully comedic, and he delivered them flawlessly. The rest of the cast is also brilliant. Hopkins is commanding and strong as the king. Tom Hiddleston plays Thor’s insidious brother, Loki. Idris Elba as the Gatekeeper of the realms is pretty badass. Natalie Portman plays Jane Foster, a scientist who helps Thor when he comes to Earth. Portman and Hemsworth have great chemistry, and their connection is just one of the reasons why at the end you’ll want a sequel. Foster’s colleagues are played by Stellan Skarsgard and Kat Dennings. Stellan is great as usual, and Dennings is superb as the comic relief, delivering her lines at perfect comedic timing. In the end, this movie made me very excited for The Avengers. By “the end,” I mean MAKE SURE YOU STAY AFTER THE ENTIRE CREDITS. After the credits, a nice little scene awaits you; it pretty much sets up part of The Avengers storyline. Thor is, without a doubt, the best new movie out this weekend. In my opinion, the marketing and trailers haven’t made Thor look appealing, especially to female audiences. As a girl (who is pretty girly and slightly geeky), I loved it. If you’re heading out to the theater, it’s definitely worth your buck seeing Thor. In fact, I’m looking forward to seeing it again this weekend! Thor is now playing in theaters. Previous ArticleFilm Review: 'Something Borrowed' is something awful! Next ArticleListen to Episode 4 of our TYF Podcast!